The Google Nexus One, unveiled on Tuesday, has all the bells and whistles to challenge Apple's ever-popular iPhone -- thanks in large part to the slick new version of the Android OS that it runs. But if you use an earlier Google Android phone, don't hold your breath waiting for the latest version of Android to make its way to your handset. It will likely be a while before you get to taste the entire Nexus bonanza. 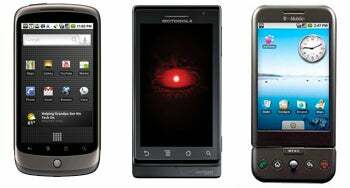 Here's a prime example: the Motorola Droid, available on Verizon Wireless. Late last year, the Droid was launched with a fanfare, touting the then-brand-new and unique Android 2.0.1 version of Google's mobile operating system. It had some sleek GPS navigation features and an improved interface, which were the best that Android had to offer - until Google unveiled the Nexus One this week. From G1 (right) to Nexus One: the evolution of Android phones. The Nexus One runs on Google Android version 2.1. It builds on some of the new features introduced on the Droid and adds more, such as live wallpapers, an expanded home screen (5 instead of 3 panels), a new home-panel navigation system, 3D photo gallery, and redesigned app drawer. Hardware advancements have allowed manufacturers like HTC and Google to create speedier phones and to add sleek features such as voice-enabled typing. Point in fact, the Nexus One runs on a 1-GHz Qualcomm Snapdragon processor, while the Motorola Droid's processor runs at just over half that speed (550 MHz). Older Android phones, such as the HTC Hero and the T-Mobile G1 both run at 528 MHz. RAM and ROM memory have also doubled over time. Each device was clearly designed in mind for a specific version of Google Android, and they all got better in time. Certain Android updates (1.5, 1.6) have updated the mobile experience of users across the board, but the latest 2.0 and 2.1 iterations of the OS are taking longer than expected to make their way down to older Android phones. With such major differences in hardware between the Nexus One and older generations of Android phones, it's likely that the 2.1 update will take a while to filter down to the other Android phones, some of which were not speedy even with the initial release of the OS. To back this up, Android phones manufacturers are still using inexact timeframes for the arrival of 2.1 on older devices ("soon" is the buzzword). This sort of approach to updating phones to the newest version across the board is reminiscent of the declining fortunes of Microsoft's Windows Mobile. You can still buy new phones today running on the 6.1 version while others run on 6.5, and the upgrade policy is more than confusing for the average user. Actually Google uses the same multiple manufacturers approach as Microsoft, only that it licenses for free its Android OS. Take in comparison Apple - even on the original iPhone (2007), you can still run the latest software update (3.1.2), albeit not as fast as on the iPhone 3GS and without certain features such as GPS or video recording. However, iPhone users, old or new, have always had the choice to freely upgrade to the latest software version, usually within days of the launch of the new version. On the long run, the extended period of time until older Android phones users receive the latest version of software could stimulate the sales of newer devices, such as the Nexus One. But this could also have downsides for the search giant, as users on a budget, but always in search for the newest features will opt for other platforms (such as the iPhone), where new features and updates make their way down to older models fast and free.